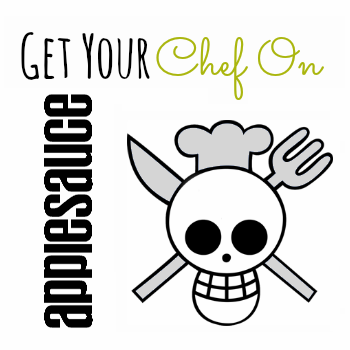 It’s time for applesauce lovin’ kids and another round of Get Your Chef On entries. This round Jen picked applesauce, and I was all for it. Yes we could have done apples, but applesauce it slightly more challenging and there was a good chance we’d see lots of desserts. Yay! I went hunting for a good applesauce recipe. 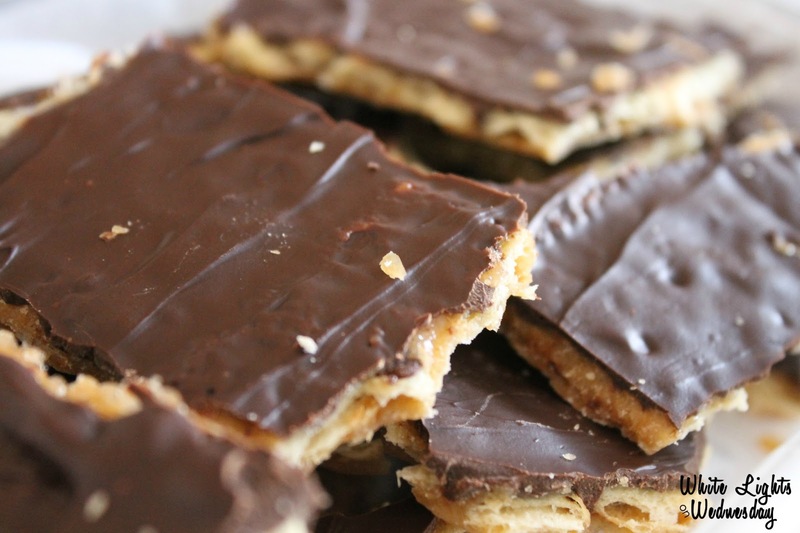 Something different than just substituting applesauce for oil in a baked goods recipe. I wanted to applesauce to shine. The other night, Jen was talking me off a Mom cliff while Eddie screamed for about 30 minutes that he didn’t want to go “nigh nigh” all while Mike was out of town last week. I grabbed a glass of wine, we talked some smack, and I Googled. I found this cake recipe, showed it to Jen, got a big thumbs up, and low and behold…I had everything on hand. Winning! So here we are. A yummy dense cake, that is full of fall smells, but good enough to eat year round. Oh! And we reazlied that like almost all my GYCO recipe posts have been cake or pizza, except for two. What can I say? I like cake and pizza! In a medium saucepan over medium-high heat, cook applesauce until just beginning to boil. Stir in oatmeal. Set aside; let stand for 20 minutes. Preheat oven to 350 degrees F. Make sure oven rack is at least 6" from top of oven. Coat a 9" x 9" baking dish with non-stick cooking spray; set aside. In a medium bowl, combine flour, baking soda, cinnamon, nutmeg, and salt. Set aside. In a large bowl, cream together butter and sugar until light and fluffy, about 2 minutes. Add vanilla and eggs, mix until combined. Add flour mixture to butter mixture in two additions; mix until just combined after each addition. Add applesauce mixture and mix until just combined. Pour batter into prepared baking dish. Bake for 40 to 50 minutes, until cake has browned and a toothpick inserted in the center comes out clean. In a small medium bowl, combine coconut, brown sugar, walnuts, melted butter, and milk. Mix until combined and all ingredients are moistened. Carefully spread topping over hot cake, and return to oven. Turn over to broil, and cook 1 to 2 minutes or until top is golden and bubbly. Remove cake from oven. Cool 30 minutes, and serve warm. Yum! 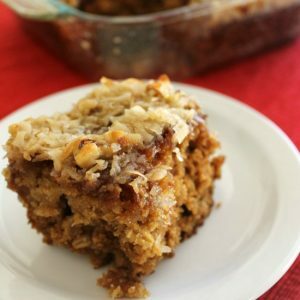 I love the idea of an oatmeal and apple sauce cake! I love oatmeal and apples! This looks awesome! 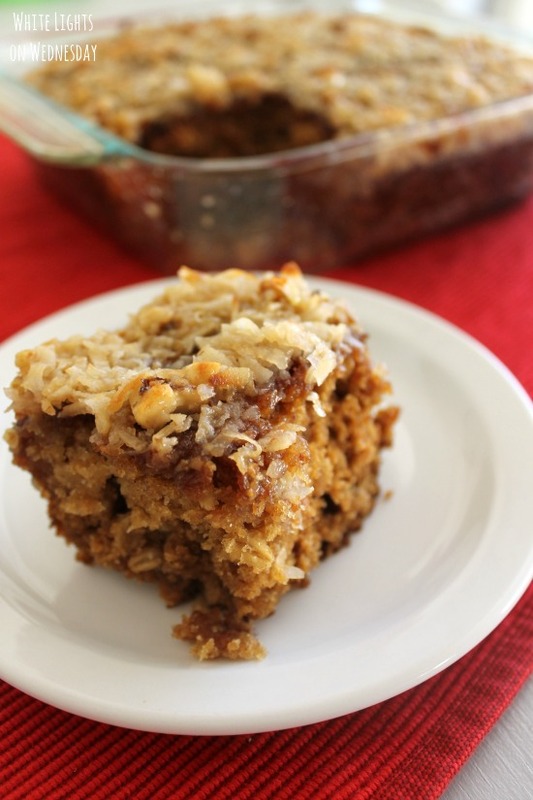 I am LOVING this Applesauce Oatmeal Cake! 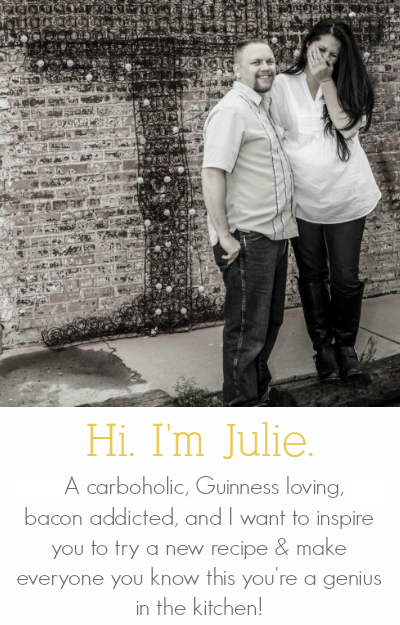 Pinned this and shared on FB 🙂 Thanks so much for linking up to All My Bloggy Friends – Have a great weekend, Julie! It’s so yummy Jamie. Thanks for sharing! This looks so kid-friendly. I think my two toddler boys would love it! Question—the only ingredient I don’t have on hand is walnuts. Do you think it would be ok if I left that out? Stopping by from the Tater Tots and Jello link party. Pinning now! You could totally leave the nuts out, or use whatever nuts your like – pecans, macadamia nuts, etc. I never thought to use graham crackers instead on nuts. That’s a brilliant idea! So glad you liked it!! I made this for the first time today. The topping sounded so good, I doubled it. I do feel a little guilty about that, but yum yum! The cake was wonderful, too, made with fresh homemade applesauce. I doubled the topping, felt a little guilty, but it was so yummy I’ll do it again next time. I’ve made this cake several times and it’s wonderful!! My son has a nut allergy and it’s even delicious with just a butter and sugar glaze on top. Make this cake everyone, it’s fantastic!! Made this a couple months ago it’s now my husbands favorite cake. I have in the oven right now but this time I added raisins! Raisins sound like a great addition Sharon! 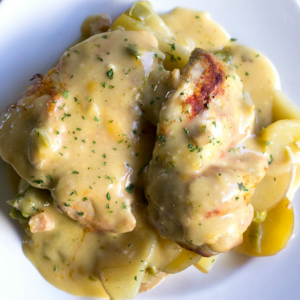 Does this double easily for more servings?